And scissors! Grab those too. And a bag. OK now you’re set. Find some nettles. Check near water, or disturbed edges. Public farmland is a great place to start (and nettle hunting is a great excuse to visit!). Using the aforementioned scissors, cut off the top 2 or 3 whorls of leaves, snipping the stem between nodes. Drop in your bag. The remaining plant will continue to grow, sending out new leaves, able to survive and return next season. Bring a friend! Or your kids! Nothing says cherished memories like rubbing fern leaves on your sweet child’s leg while reassuring her that nettle sting doesn’t last forever. Bribe said child with ice cream if she’ll just smile and hold this nettle up near her face so we can get some good shots for the newsletter... But not that close! Careful! OK! That’s good. Retreat carefully, since now that you stop to look there are nettles all around you. Take your hard-earned treasure home and feast! 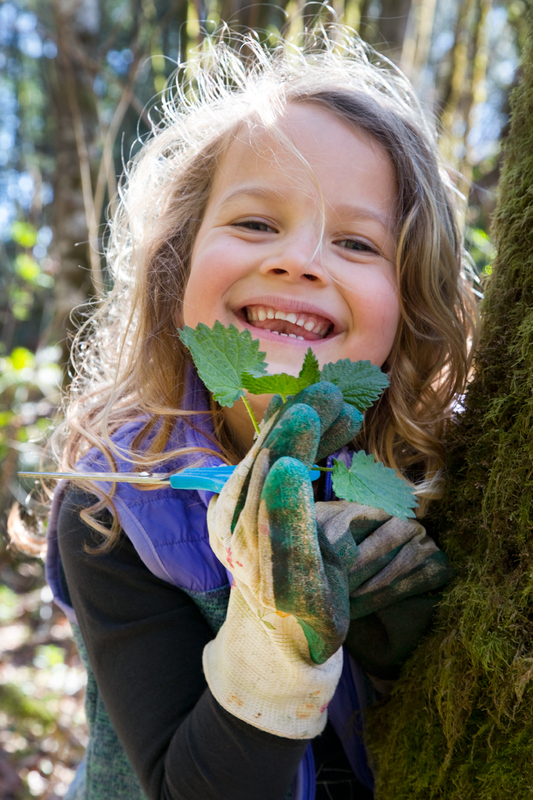 Revel in your well cemented status as a Pacific Northwesterner, giddy and joyful at the emergence of nettles, grateful for the return of spring, and contented knowing your sustainable harvesting ensures a steady supply for years to come. Enjoyable ways to consume nettles include, but are certainly not limited to: pesto; tea; blanched and seasoned with olive oil and salt; a filling for lasagna; stuffed into enchiladas; anywhere you’d use spinach or other tender greens. Blanch the nettles in boiling water for approx. 1 min, then move to an ice water bath. They should be bright green. Be daring! Grab a handful and squeeze out the water, praying the whole time that you really cooked them enough to take out their sting. Put squeezed out nettles, olive oil, pine nuts, garlic and salt into blender or food processor. Process until smooth. Add Parmesan cheese and pulse to combine. Blend all ingredients above except cheese. After putting sauce in freezing container (8 oz freezer jars work nicely), carefully pour in just enough additional olive oil to completely cover the surface. This will prevent air contact which will turn the pesto very dark. Do not add Parmesan cheese before freezing. When ready to use frozen sauce, defrost in a bowl of hot water or at room temperature. Add Parmesan cheese and mix. If necessary, thin slightly with hot water from boiling pasta.